I have sold a property at 311 2057 3RD AVE W in Vancouver. Make your next home this exquisite 1 bedroom condo in the Sausalito, a solid, rain screened building nestled in the heart of Kitsilano, one of Vancouver’s most desirable neighbourhoods. Extensively renovated, this bright, south facing unit features high end laminate flooring, designer paint, dramatic crown moldings & baseboards, elegant lighting, custom closets with organizers, a beautifully remodelled open plan kitchen with stainless appliances, in-suite laundry, and a wonderful bay window overlooking a quiet, tree-lined street. Located only 2 blocks from the beach, and 1 block North of 4th avenue shopping, transit & cafes this home has it all! I have sold a property at 1058 13TH AVE E in Vancouver. MOUNT PLEASANT 33X132 RT-5 LOT with FOUR SUITE HOUSE. This is an excellent opportunity for builders, renovators and investors to acquire a home on a quiet, family oriented street in the heart of Vancouver. The original home was built in 1912 and renovated over the years. Currently it has two legal dwelling units with two additional garden suites. There is a top floor, two bedroom with a four piece bath. The Main has two bedrooms + den and a four piece bath. Downstairs are a one bedroom unit with four piece and one bedroom with three piece bath. The house is in an advanced state of deferred maintenance and in need of extensive renovation. The lot has a South backyard with a single garage. YOU’LL LOVE IT! 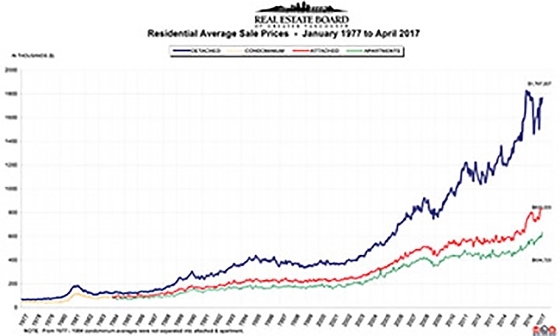 VANCOUVER, BC – May 2, 2017 – Demand for condominiums and townhomes continues to drive the Metro Vancouver* housing market. Residential property sales in the region totalled 3,553 in April 2017, a 25.7 percent decline compared to April 2016 when 4,781 homes sold and a 0.7 percent decrease from the 3,579 sales recorded in March 2017. April sales were 4.8 percent above the 10-year average for the month. For the first four months of the year, condominium and townhome sales have comprised a larger percentage of all residential sales on the Multiple Listing Service® (MLS®) in Metro Vancouver. Over this time, they’ve accounted for 68.5 percent, on average, of all residential sales. This is up 10 percent from the 58.2 percent average over the same period last year. New listings for detached, attached and apartment properties in Metro Vancouver totalled 4,907 in April 2017. This represents a decrease of 19.9 percent compared to the 6,127 units listed in April 2016 and a three pe cent increase compared to March 2017 when 4,762 properties were listed. The total number of residential properties currently listed for sale on the MLS® system in Metro Vancouver is 7,813, a 3.5 percent increase compared to April 2016 (7,550) and a three percent increase compared to March 2017 (7,586). The sales-to-active listings ratio for April 2017 is 45.5 percent for all property types. This is two percent below March 2017 and is indicative of a sellers’ market. Generally, analysts say that downward pressure on home prices occurs when the ratio dips below the 12 percent mark for a sustained period, while home prices often experience upward pressure when it surpasses 20 percent over several months. By property type, the sales-to-active listings ratio is 26 per cent for detached homes, 58.2 percent for townhomes, and 82.2 percent for condominiums. The MLS® Home Price Index composite benchmark price for all residential properties in Metro Vancouver is currently $941,100. This represents a five percent increase over the past three months and an 11.4 percent increase compared to April 2016. Over the last three months, the benchmark price of condominiums has seen the largest increase in the region at 8.2 percent, followed by townhomes at 5.3 per cent, and detached homes at 2.8 percent. Sales of detached properties in April 2017 reached 1,211, a decrease of 38.8 percent from the 1,979 detached sales recorded in April 2016. The benchmark price for detached properties is $1,516,500. This represents an 8.1 percent increase over the last 12 months and a 1.8 percent increase compared to March 2017. Sales of apartment, or condominium, properties reached 1,722 in April 2017, a decrease of 18.3 percent compared to the 2,107 sales in April 2016.The benchmark price of an apartment property is $554,100. This represents a 16.6 percent increase over the past 12 months and a 3.1 percent increase compared to March 2017. Attached, or townhome, property sales in April 2017 totalled 620, a decrease of 10.8 percent compared to the 695 sales in April 2016. The benchmark price of an attached unit is $701,800. This represents a 15.3 percent increase over the past 12 months and a 2.4 percent increase compared to March 2017.